Preheat oven to 400. Rinse carrots and slice on diagonal to mimic the shape of the peas. Use kitchen shears to trim off the fiberous tips of the peas. 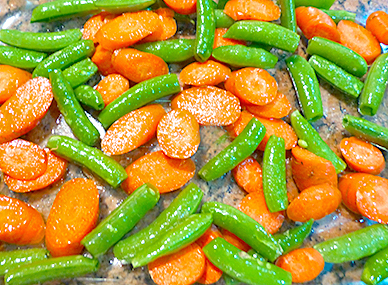 Toss the carrots and peas in olive oil, and salt and pepper and lay out on 1-2 cookie sheets in a single layer. Roast for 10 minutes, then stir veggies, then roast for another 15 minutes or so until veggies become more tender and golden.